Last Thursday’s ride took me down to the Inner Harbor to meet A. and her sweet baby girl for a tour of the Christmas Village. It was empty, which I suppose is to be expected on a Thursday afternoon. That worked for the 19 month old kiddo I was with who mostly wanted to oh-so-carefully step her way down stairs and then run up them to slowly sneak down them again. And then she wanted to run as fast as she could, which wasn’t very fast if we’re being honest, and everyone who saw her could help but smile. I think this is why they make children, and it’s why they should be out in the world as much as possible–they love it, we love it. And then it was time to meet N. for the AFSCME march and rally. I hadn’t really been listening when she told me where to go, so I found myself circling downtown blocks trying to find the show. I used my classic tools–listen for the group chanting, follow the cops, find the traffic jam–but to no avail. I finally locked up where I knew it was ending and made one last guess. And I found it. Hundreds of folks were jammed into the Harbor Hotel, Santa included, and by the time I got there folks were rallying from the main stage: You look gooooooood in your AFSCME green! I hadn’t found them on the streets, because the rally isn’t just about telling other people what you want. It’s about telling yourselves what you want, and getting brave and knowing you aren’t alone and gathering the energy because getting Larry Hogan to come to the table to negotiate for a small pay raise and the right to get paid for that extra day you’re going to work in the leap year is going to be a long, long road. (Yes, they want state workers to work for free on February 29, 2016. That’s exploitation, not a charitable donation.) And then everyone streamed into the street, and I joined them, donning an AFSCME cap my ladyfriend snagged. We marched and chanted and it felt amazing. There were hundreds of people there, a reminder that organizing is a long term effort. We all get so distracted by The Event–and rightly so, sometimes–that we can forget that behind the scenes folks are working very hard, all the time, to make these demands, because nothing’s conceded without them. When Hogan was elected he changed the welcome sign on the state borders to read, “Maryland: Open for Business.” What a total bummer. 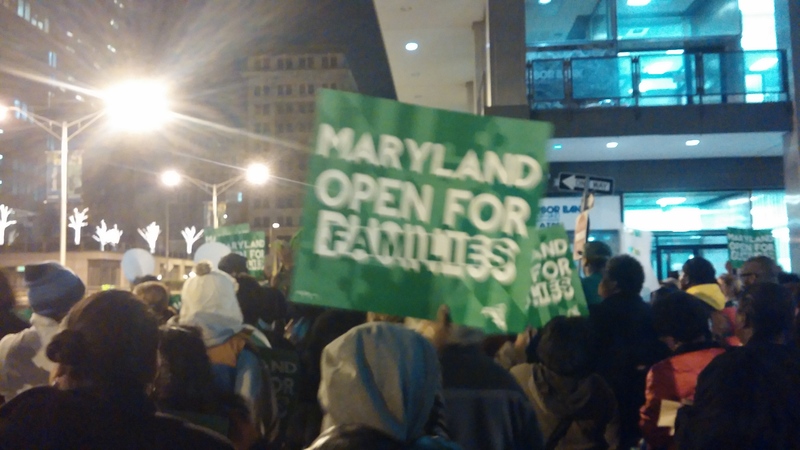 I’m with AFSCME: Open for Families, please, and let’s define “family” really, really broadly, thank you very much. And then I took my bike and headed back up the hill to home. This entry was posted in bikes, politics and tagged AFSCME, Baltimore, marches, unions. Bookmark the permalink.